A woman is harassed by a supernatural ghost clown that has given her a countdown to her death. Now, it is up to her and her friends to find a way to beat this entity before it's too late. We wonder how long it took writer Brad Belemjian and writer/director Aaron Mirtes to come up with the title "Clowntergeist," because however long it took, it was worth it. The main reason we wanted to watch this movie was due to its title. This film seems to expand on Aaron Mirtes' super creepy debut short film "The Clown Statue," which is essentially rehashed in the first death sequence. 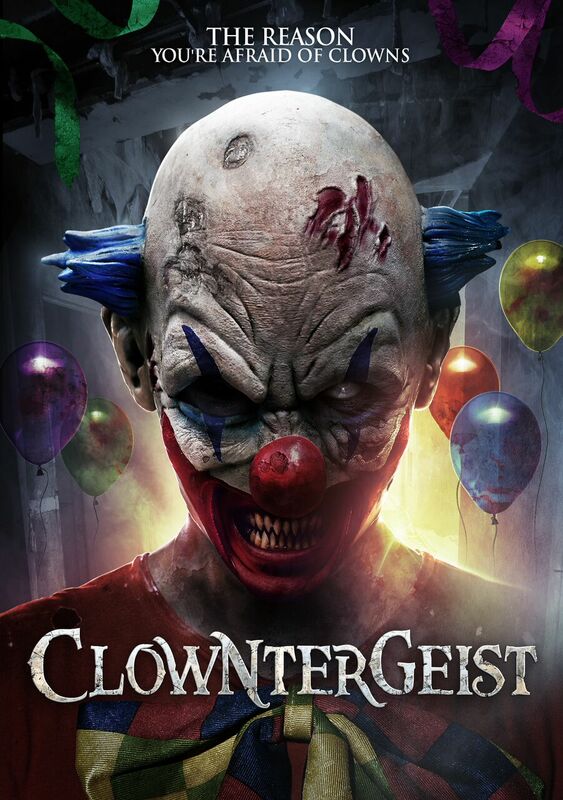 The story is changed to make the clown antagonist a supernatural entity. Each of its victims receives a red balloon with an exact time and date written on it letting them know when they will die. The use of the red balloon imagery could be seen as an homage to the clown horror film "It," or possibly a ripoff depending on how you look at it. Clowns are creepy enough on their own before bringing the supernatural into them. I outright hate clowns, which is an opinion and fear many people share, which is why they make such damn good villains in horror films. This is a low budget B-horror movie, so we can be forgiving of an inexperienced cast and/or lower production values. Unfortunately, that isn't the biggest problem with "Clowntergeist." We would have loved to have seen a tense film about a murdering ghost clown, but director Aaron Mirtes resorts to cheap, ineffective jump-scares to startle the audience far too frequently. Moments like these aren't scary, they are just loud, annoying, and expected. We're sure, dear readers, you already have the image of a creepy clown in your head, all Mirtes had to do was capitalize on it properly, but mostly fails to do so. It feels like the writers thought up their overall concept and got lost in how to fully realize it. They wanted to have a clown antagonist killing and harassing people, but the mechanism in how people are chosen and the final reveal of why it all happens is a very weak design. We would have hoped they would have been a little more creative and found a way to build more tension, but it often winds up feeling like a generic slasher flick. Also, there's not enough clown in the first place! There are a few unsettling and gory moments, mostly involving the bloody remains of a family pet. As dog lovers, it certainly grossed us out, but these instances are few and far between. We had hoped "Clowntergeist" would have been a hidden horror gem that could have built itself to cult status, but unfortunately, it is much too forgettable and not effective enough as a horror movie.